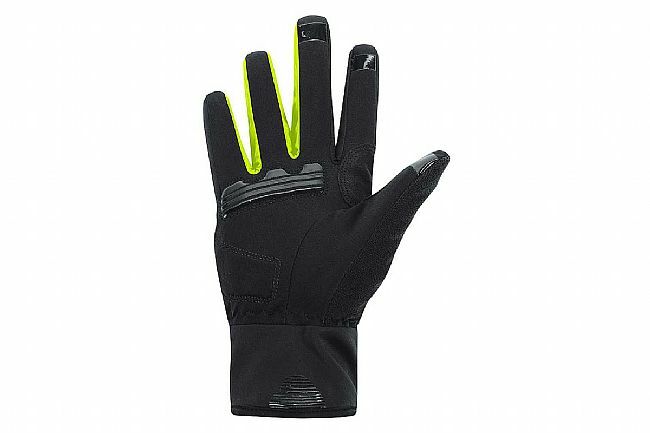 Gore's Men's Power Windstopper Soft Shell Glove keeps the wind off hands so you can keep biking. Cold fingers and hands can make a ride miserable and downright unsafe if feeling starts to leave them. To combat this, throw on a pair of these gloves featuring the WINDSTOPPER® membrane and block the chill from getting to vulnerable fingers. That's not all these gloves have going for them though, they also have padding strategically placed for comfort on the handlebars, thermo lining for some added warmth, and reflective elements for added safety. A must have for riding during the colder months. Available in Black and Black/Neon Yellow. Worn these gloves for 3 rides in the upper 40s. Work great. Hands stay warm but do not over heat. Mens small fit me. Usually a womens Medium. I found these gloves disappointing. Bicycling gloves that work poorly (if at all) with a Garmin or phone touch screens. If you do not use a touch screen product these gloves work fine. For me, they need glove liners In weather below freezing, below 28 degrees use a chemical heater as well. I found them comfortable enough to use on a ride with a wide temperature range ( 24 to 50 degrees). Will not use again on a ride where I need to use my phone or bike computer. These are very warm to the upper 20's but over 35 they were just too warm at which point my hands would sweat. Although they did not fit tight, when the liner was damp these were very hard to get off and harder yet to get back on. Maybe I would have been happier with a larger size. I gave them to a friend who sweats less with slightly smaller hands and she loves them. Like most of the other reviewers here my hands tend to get cold first during a ride before any of my other extremities. I have searched high and low over the years for gloves that are windproof, low profile, and warm down to 32 degrees. I bought these with the hope that it can meet all of my requirements and for the most part I have been pleased with these gloves. They are decently warm down to the low 40s. Anything cooler than that requires glove liners, which stretched the comfort range a bit lower, but not much more. My hands were pretty cold last weekend when the temperature got down to the mid 30s, and this was with some glove liners. So the search for that ideal pair of winter gloves continues. Even though these gloves supposedly use Windstopper material I think the material is used sparingly and only in a few places along the back of the gloves. This may contribute to why they are not as warm as advertised. I picked these up for cold weather bike riding and high speed (35 mph) moped riding in cold weather (down to mid-30s). So far they shine well on cold weather wind breaking on the moped. After today's ride in the rain, I would even rate water resistance fair. Very satisfied, but too early to say how well they will hold up. Above 40 degrees they seem to work just fine! Comfortable gloves... however, on a cold morning, which was probably 35 degrees on my first ride, they didn't seem to keep my hands as warm as I had expected. The product name Windstopper and brand name Gore had a higher connotation with me than what the product accomplished. But, above 40 degrees they seem to work just fine. good to about 40 degrees F for these 60-year old fingers. Good down to 20 degrees inside of Bar Mitts. Well made gloves. I was hoping for a little more warmth. I seem to get colder hands than most. When I have worn these with liners, I have been O.K. in temperatures as low as the mid thirties. Lower then that, cold fingers! Great for cool wet weather. 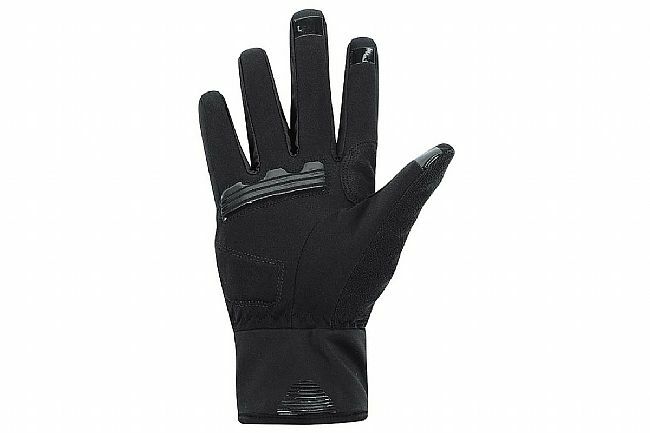 I generally do not ride if it's really cold but these gloves are great for the mid 30's. I bought them for the cooler rainy northwest days and they meet my needs. They are comfortable and fit me well. I tossed around several different gloves at different price ranges and these were worth a try and I am happy. Can not comment on longevity but I hope they last a while. Good for tems as low as 32 deg. the gloves are good for temps above 32 deg. below that fingers start to get cold. One of the gloves have the care tags that are HUGE. I had to cut them off before I even tried them on. Nice gloves but the fingers are not long enough. The gloves look good and appear to be well made, with extra cuff, nose wipe panel, padding and device friendly. I use these gloves on my early morning rides. Winter at 5am in Southern California I.E. gets down to the mid 30s, low 40s. Bought the gloves just for that and in the beginning of each ride my hands are fine but after 20 miles with 20 more to go my fingertips are starting to hurt. Most bike wear is made longer because your riding in a stretched out position and I really appreciate that since I'm 6'-6 and 240lbs. When I buy the XLXXL gloves they shouldn't just be wider - they also need to have longer fingers. I bought these in yellow just as an extra pair. The lining is comfortable & warm, keeping out the cold & wind. They seem to run a bit small, & are not world class stitching.